Dental x-rays enable us to see inside a tooth. This quick guide shows you some of what we see and what we are looking for. 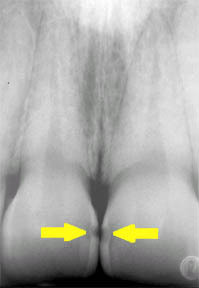 This is an x-ray of the back teeth on the upper arch. With x-rays, you can only see the hard tissues, such as the teeth and bone but you cannot see the soft tissues, such as the gums, lips, or nerves. This enables us to differentiate between normal tooth and bone and diseased tooth and bone. The green arrows are pointing to the bone. The blue arrows are pointing to the healthy enamel. The red arrows are pointing to the pulp, where the nerve and blood vessels are located for a tooth. The dentin layer is between the enamel and the pulp. 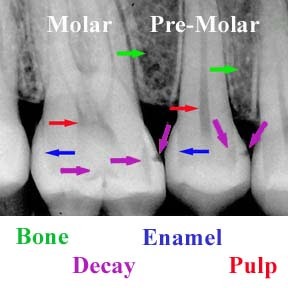 The purple arrows are pointing to areas of decay, which show up as a dark spot on x-rays. Bacteria have attacked the tooth and have dissolved the enamel and entered the dentin. The decay must be removed before it dissolves the dentin and enters the pulp. If the decay enters the pulp, the tooth will require either a root canal or an extraction. This x-ray shows cavities between the front teeth. 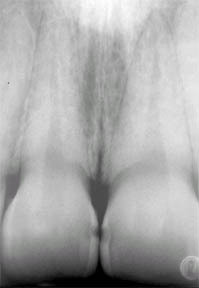 This is an x-ray of the two front teeth on the upper arch. You can see the dark area created by the decay. 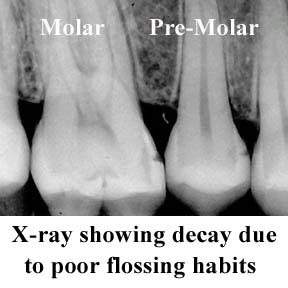 This decay was most likely caused by a lack of flossing, as are most cavities that occur between the teeth. This is the same x-ray but the arrows have been added. The yellow arrows point to the decay. These areas of decay, since they will show when the patient smiles, will need to be restored with a tooth-colored filling that matches the surrounding tooth structure. This usually takes one office visit.